Optical coherence tomography (OCT) provides tissue morphology imagery at much higher resolution than other imaging modalities such as MRI or ultrasound, and the machines are comparatively cheaper. It is an easy technique to perform; is non-ionizing, and therefore safe. These benefits are driving a rapid transformation of OCT, from its principal application as a research tool, into an extension of the 'neurological examination' in routine office practice. Originally used in assessing the severity of tissue damage and prognosis of multiple sclerosis and various neuro-ophthalmic conditions, OCT is increasingly used in other neurological disorders such as Parkinson's disease, ALS, and Alzheimer's disease. 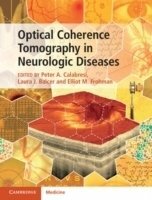 This book is the first comprehensive review of the use of OCT in neurological diseases. The coverage includes a description of the technique and its utilization in a variety of neurologic conditions. Essential reading for neurologists, neuro-ophthalmologists, and neuroradiologists wanting an introductory account of the clinical applications of OCT.